For every shaving man, the desire is to have a very effective clean shave with little or no stress – this is why many have gone back to using straight razors. Straight edge razors easily make the task of getting a total clean shave look pretty easy and requires only a deftness born of practice. 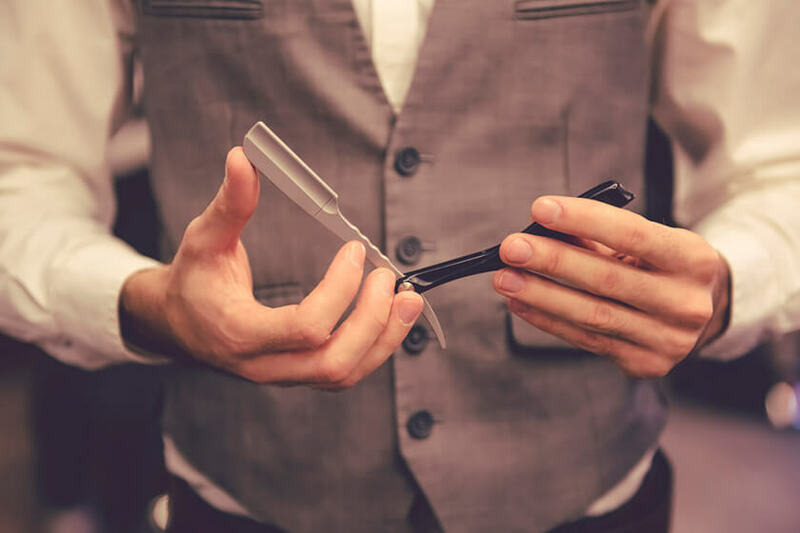 Straight razor shaving is a wonderful option but as with many other products in the market, selecting the best straight razor could be quite a rigorous process. This is exactly what this article is here for; to help you make the best choice and reduce the stress you would have to go through in order to make this choice. The Dovo straight razor remains one of the best quality razors on the market thanks to the high quality standards observed by its manufacturers. It has a strong handle made from olive wood and the blade’s durability is not to be argued about. Although the price of this straight razor is on the high side, its features and quality easily trump the price tag. Money spent on this razor is definitely not wasted and the obvious gracefulness of this blade when in use is a beautiful sight. If you are looking for a blade to use long term, then Dovo straight razor could be the perfect choice for you. High quality materials and the guarantee of a great shaving experience is assured. Parker straight razor is designed for use by both barbers and the average shaving man; this dual purpose easily makes it a favorite. This razor boasts of a stainless steel blade that is of the highest quality and an overall weight that makes shaving seem effortless. For the price of this straight edge razor, the value gotten is sure pretty much. Asides from the fact that it is manufactured with high quality materials, it also comes with blades that cover a large number of shaves conveniently. It is also easy to use and guarantees a wonderful shaving experience. If you are looking for a great razor at a very affordable price, then you’ve got no need to look any further; Parker safety razor should cater to your needs. It is pretty easy to use especially after you have mastered it and it guarantees a great shave. A.P Donovan straight razor set offers you everything you would actually need to enjoy using the straight razor within a single package. This straight razor kit includes mahogany and stainless steel brush, a badger hair, a durable and portable abrasive leather strop with a metal carabiner belt and abrasive paste, soap and a crafted, decorative wooden box. Just by taking a look at the packaging and the content, you wouldn’t be needing any further convincing of the value you would derive for your money from this kit. The durability and originality of the tools within the kit makes it worth every cent spent on it. If you intend to use this blade, ensure that you already have some measure of experience using straight razors- this is mainly because of the large blade size. Overall, this cut throat razor makes for a great shaving tool. This straight razor is made in Japan and has come to stand at the same level with some of the best blades available in the market. The Feather SS Japanese Straight Razor brings shaving to a whole new level where it is fun and not just a chore. Feather SS Japanese Straight Razor Blade is made from silicon resin and stainless to guarantee a very long life span, in other words, this could be a life investment. Similarly, its sleek and classy design gives it a nice appearance and makes it very easy to use; therefore, you are guaranteed value for your money. This straight razor by Feather makes shaving a lot easier and very effective thanks to its sharpness. Also, it requires application of little or no pressure to have a clean and smooth shave. In conclusion, this is a blade that is very suitable for beginners and entrants into the shaving world. This razor is specifically designed to be used by professional barbers but could also be used by the average person as long as you know your way around using it. The razors go through a very tough manufacturing process in order to create the best and only premium quality materials are used during this process. 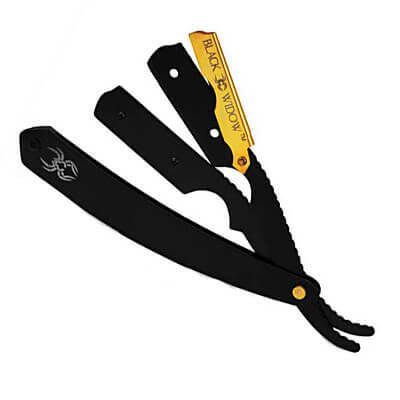 Black Widow Executive Brand Razor is specially designed for barbers who know their salt. This razor provides great value for every cent spent on it and is made from durable materials to ensure a long lifespan. In essence, this blade is designed for barbers and for individuals who have had some experience using straight razors. Although it is great to use, it could be quite dangerous for the beginner. Therefore, only professionals should make use of this blade. 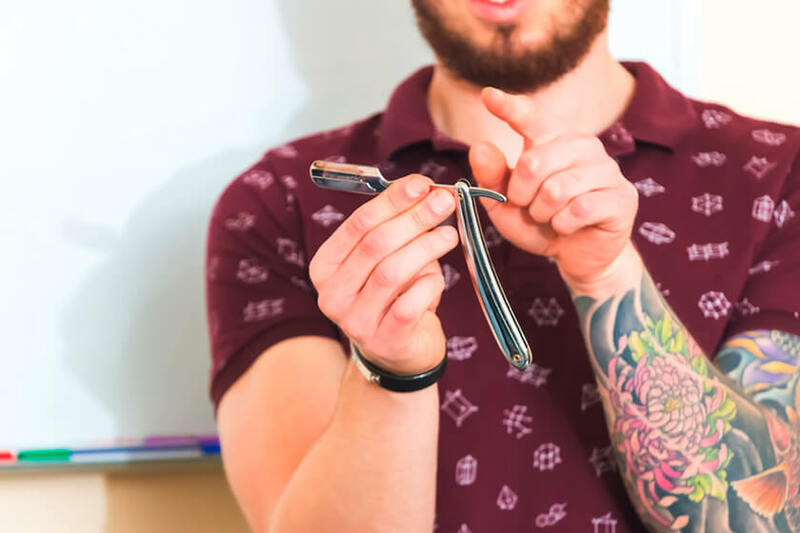 Upon deciding to make use of the straight razor for shaving purposes, the choice of a straight razor is a very important decision that needs to be taken very carefully. This is mainly because straight razors are a bit more technical than they may look judging from their simple designs. Since straight razors are designed to last for a very long time, making an educated and thoroughly thought out decision is essential to not making a mistake and ending up with regrets. Furthermore, taking into consideration that straight razors are not like other shaving tools which are simpler to operate, you would need to be somewhat knowledgeable in order to select the best straight razor. This is why we have come up with a number of essential factors that you should consider when buying a straight razor. Furthermore, there are some tips that would go a long way in helping you make a great choice. Here are the essential factors and tips alongside all that you need to know. A square point which is also known as a sharp point blade usually boasts of a straight, streamlined shape that stops off at a sharp point that lies at a perpendicular position to the razor’s cutting edge. Using this type of razor requires some experience and is very suitable for shaving small and sensitive areas. A French point blade usually has a profile that bears a distinct resemblance to a quarter circle and just like the above-mentioned square point blade, it terminates in a sharp point. This sharp point is know in some circles as an â€œoblique pointâ€�. As the name implies, the blaint point profile usually lacks sharp end points and has a semicircular shape. This makes it very suitable for use by beginners compared to the other blade types. Making use of this blade type does not require any previous experience. Usually, straight razors are either made with carbon steel or stainless steel. The major difference between these two is in terms of quality. Basically, carbon steel straight razors are a lot more durable than straight razors made with stainless steel. However, stainless steel razors are very much cheaper and usually last a longer time than carbon steel straight razors after they have begun to undergo sharpening. Typically, a larger number of shaving men make use of stainless steel straight razors relative to carbon steel straight razors. Temper in this case is not referring to temperament or emotions. The temper as related to straight razor refers to the straight razor blade. They are three types namely soft, medium or hard temper. The temper usually determines how easy or how difficult the straight razor blade would be to sharpen and how long it would keep its edge. Basically, the harder the temper of your straight razor blade, the longer it would keep its edge and the more difficult it would be to sharpen. However, a softer temper is easier to sharpen but the edge may not last as long as that with a hard temper. The width of a blade simply implies the distance between the straight razor’s cutting edge and the back of the blade. In width measurements, increments of â…› are used which means that an 8/8 blade is an inch wide and a 4/8 blade is only half an inch in terms of width. However,the width of your blade does not have a very significant impact on the closeness of your shave provided that you hone or strop your blade properly and maintain its edge.Generally, smaller blades make for an easier stropping than large blades. Also, getting a large blade as a beginner isn’t advisable to do due to the fact that it is a lot harder to manipulate without experience and the shaving process is a lot more aggressive than smaller blades. Smaller blades can be manipulated deftly and makes shaving pretty easy. The concave shape of the blade refers to the grind. A blade that comes with a full hollow grind would be a very light and sharp one while blades that have less hollow grinds are suitable for use by beginners due to the fact that they are less sharp. Despite the popular saying that price does not always determine or correspond to the quality of a product, this does not imply that you should settle for less when purchasing straight razor. Straight razors can be found to be between the range of $5 to thousands of dollars. It is actually advisable that you avoid low-end razors at all costs due to the having they can wreak on your face. 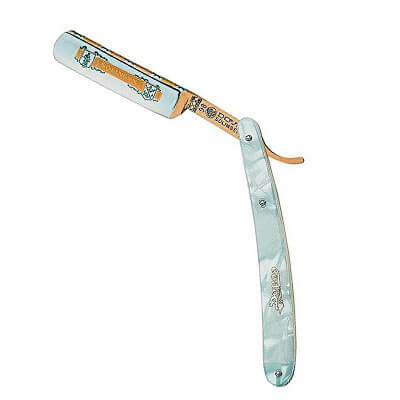 A straight razor made with quality materials would definitely have a relatively high price tag. Most low end razors are of very inferior quality and could be compared to shaving with a blunt butter knife. For a beginner, you could start out at the $100 mark. 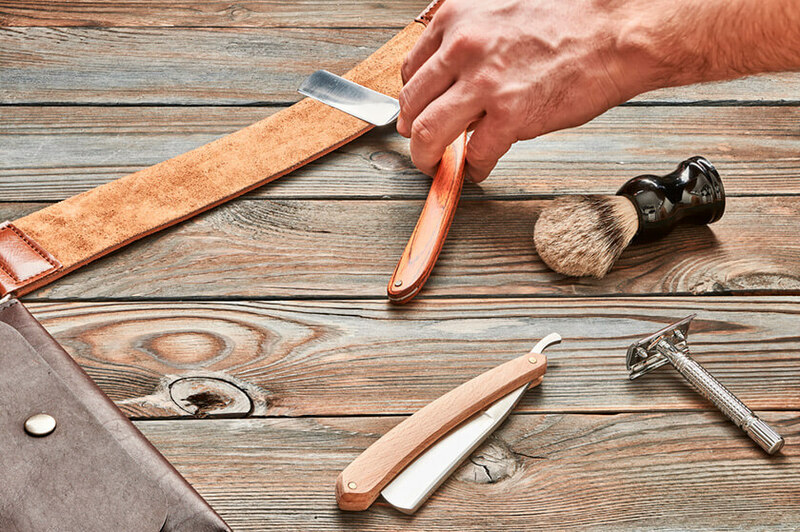 Although quality is a paramount factor in selecting a great straight razor, buying one that is stylish with a sleek design is also relatively important. This does not imply that you should sacrifice quality for style; that would be a bad decision. This only means that you should go for one that has a great design and still boasts of high quality materials. Since you would be using this blade for years, you would need to get something that you enjoy. There are many different blade variants in terms of coloring, blade ornamentation and tang, and the overall appearance. You need to find a blade that suits your sense of style and which you would be proud to show off to your friends too. Over the years, straight razors have begun making an amazing comeback into the market. Similarly, a lot of men have begun to opt for the option of shaving with straight razors. There could only be one reason for this- they are having a great experience using straight razors as compared to other Â shaving equipment. This would also imply that there are a number of benefits attached to using straight razors. In actual fact, the benefits that stem from using straight razors are massive and indeed very many. However, what exactly are these benefits and how much ease do they really offer? One very prevalent issue that accompanies shaving is the problem of skin irritation which could stem from folliculitis alongside all other skin related issues. Some minutes after some men have shaved, their skins begin to get inflamed, red and painful. This could easily ruin the day for a man since this would disfigure the face. Razor rashes, burns and general irritation that come with shaving could be a source of unpleasant sensations especially for men with really sensitive skins. However, this is mainly because cartridge and safety razors remove lubricant required by your face in multiple swipes. The benefit of the straight razor is therefore that you’re making use of a single razor and getting a closer shave thereby reducing the possibility of irritation. Every shaving man has had some experience with ingrown hairs at some point in time; specifically men who have just begun to shave. Ingrown hairs is not restricted to anyone but shaving properly can help you get rid of them. Also, the razor that you use for shaving greatly contributes to the possibility of your having ingrown hairs. Cartridge razors are designed to pull beard hairs up from the skins and cut the follicle underneath which results in irrational growth and causes some damage to the hair. Typically, an ingrown hair is one that grows out and then back into the skin leaving a lump which is inflamed and painful on the face. Since a straight razor does not raise hairs, it shaves as closely to the skins as possible thereby keeping the follicles safe and intact. This helps to get rid of the occurrence of ingrown hair. Multiple cartridge razors are designed to pull on the hair and cut the follicles. This implies that their design would not allow them to just swipe across the hair and trim it. This also means that some hair is still left on your face after shaving which is exactly what shaving is supposed to eliminate. 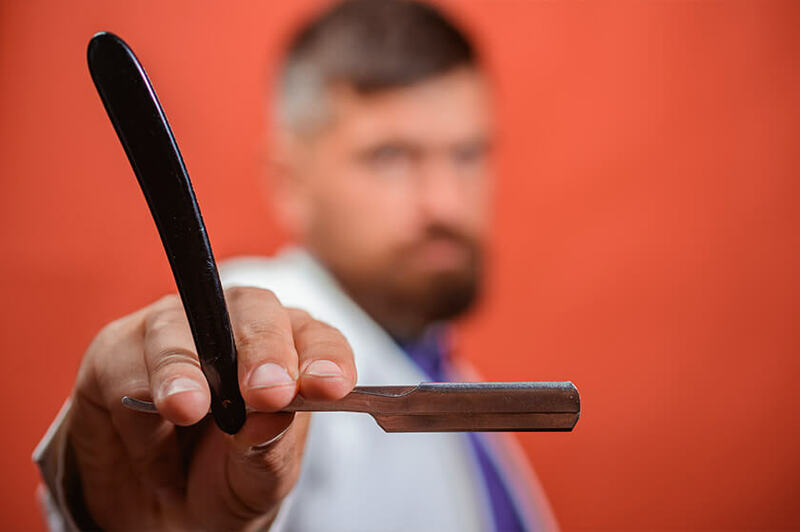 A straight razor is not designed to pull the hair and destroy the follicle which means that your follicles remain healthy and intact after shaving with a straight razor. Thanks to the closeness of the shave, no hairs are left behind on your chin neither do you have new growth within few hours. When using straight razor, you don’t necessarily have to re-shave over and over again in order to take care of any spot like you would need to do with cartridge razors. Straight razors save you a whole lot of money in a number of ways. Unlike straight razors, cartridge razors cost quite a bit since they require constant changing. Although the price of a straight razor could be on the high side, it is a long term investment that would eventually save you lots of money in the long run. In place of having to spend money on buying replaceable razors as in the case of cartridge razors, all you have to do is hone the blade 3-4 times in a year while stropping regularly. Furthermore, making use of straight razors is very environmental friendly. Disposable blades take a lot of time to decompose and are generally not very friendly on the environment. Unlike using carriage razors, straight razor offer you complete control over the manner in which you shave. This implies that the performance and the working if the balde totally depends on you. A cartridge razor might be hard to manipulate effectively due to the plastic casing which might be in the way. Also, cartridge razors have no flexibility and can therefore not be adjusted except you plan on wrecking the razor. However, with the straight razor, you’re in control of the pressure applied, the precision when transitioning the grain, and even the angle of shaving. Straight razors help you get to those areas which might be hard to reach and guarantees you a clean shave. A shavette can easily be likened to a bicycle with training wheels. It is suitable for use by beginners or amateurs who are just taking baby walks in the straight razor shaving world. 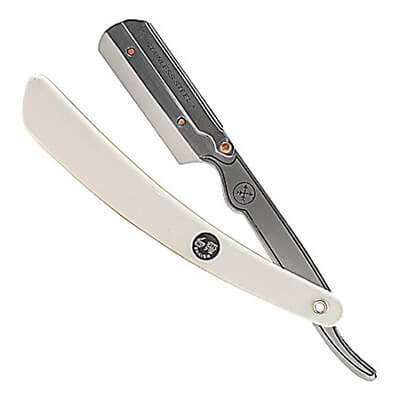 It’s appearance is like that of the straight razor but it has a standard double-edge razor blade exactly like the type used in safety razors. 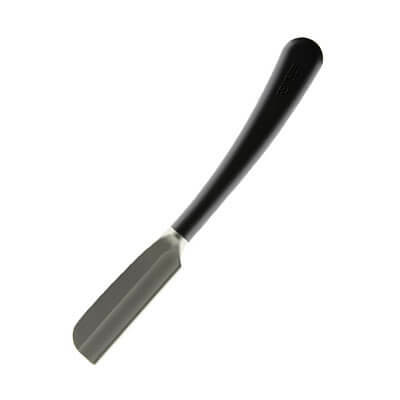 It is mainly used as a practice tool ahead of getting the actual thing which is a straight razor of course. Furthermore, it trains you and helps you get used to shaving motion and master the techniques required to manipulate the straight razor deftly. It also costs a lot less than a straight razor and does about the same job, however, the straight razor still has a lot on it. To say that the straight razor performs at the most basic of levels would be an understatement. This is because the straight razor takes shaving to a different level. It eliminates the rigor and time wastage that accompanies the use of cartridge razors and prevents your skin from getting irritated as in the case of the carriage razors. Furthermore, the blade slides over the skin very sleekly and does not require multiple passes as in the case of cartridge razors. When in use, it is usually held at about 30Â° in order to get the perfect results. Similarly, it does not require applying force or more pressure than necessary in order to get a clean shave. The sharp edge of the razor ensures of that. It is better used with lather since this would prevent total direct contact with your skin and would make shaving smoother and easier. Lather ensures that the blade simply slides over the face clearing all the hair in it’s part. For the most part, straight razors are easy to use except for some that usually require some form of knowledge and previous experience with other straight razors to make use of. In summary however, getting the hang of it is pretty easy. This remains the most common metal used to manufacture straight razors. For decades, Carbon steel has dominated the market and can be found to be used in manufacturing most of the popular brand names in the market. There are various methods involved in forging this steel but they have some characteristics in common. Straight razors made of carbon steel usually have a sharp and long lasting edge that provides a smooth and comfortable shave. These types of razors are also easy to hone but their edges do not last as long as that of straight razor blades made from stainless steel. Furthermore, carbon steel is more susceptible to oxidation and rusting and therefore requires constant drying and oiling after use. In addition, if you don’t dry your razor completely and thoroughly after use, they could develop black spots which are really difficult to remove even as early as the following morning. A lot of reputable straight razor manufacturing companies make use of carbon steel in production. 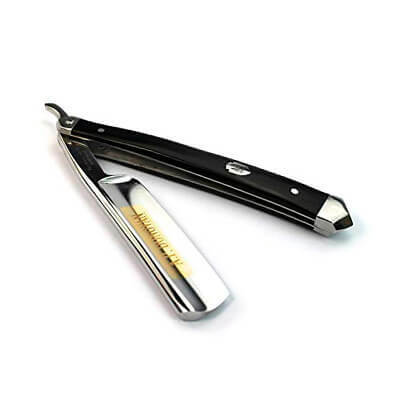 Over the last few years, stainless steel and begun to gain popularity as straight razor manufacturing material. This is mainly because it requires little or no maintenance unlike carbon steel. It does not require that you oil it or completely dry it for the blade to function optimally. Also, stainless steel razors retain their sharp edge longer than straight razor made from carbon steel. However, they are a lot more difficult to hone and the harder steel may reduce comfort when shaving with this razor type. You can rest assured that a well honestly stainless steel straight razor would work just as well as the carbon steel variant. 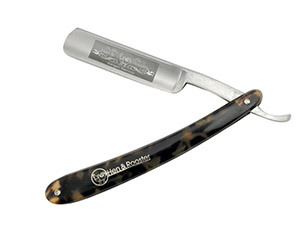 Usually, producers have very few straight razors made of stainless steel but more producers are embracing it now and including it in new models. Dovo gets a lot of attention thanks to the high quality standards which they maintain. However, there are many other brands who also create really durable blades; durable enough to compete with Dovo. Some of them are mentioned in the Review section of this article. How Do You Use a Straight Edge Razor? Shaving with a straight razor is about the same thing as using a safety razor; although it might require a bit more practice since you would be dealing directly with a very sharp edge. How Do I Sharpen My Straight Razor? If your straight razor is one that has a fixed stainless steel blade, then you would need to hone periodically and strop regularly. However, if it is the straight edge type that makes use if replaceable blades, then you would have to switch out the blade’s when they go blunt. Here you can read on how to sharpen straight razor. How Many Times Can I Make Use of my Straight Razor? One of the features of straight razors which also remains one of its advantages is that they are made from durable materials. Similarly, they are designed to last a lifetime or two. Therefore, you can use a straight razor for as long as possible provided you maintain it well. Since there are no components to wear out, it requires very little maintenance such as cleaning. Straight razors generally do not require much in the way of maintenance. However, if your razor edge is made from carbon steel, then you would need to clean and oil regularly in order to prevent the occurrence of certain black spots on the blade which might be very difficult to get rid of. If you use a stainless steel razor, then all you need is wipe it down regularly and keep it clean; stainless steel straight razors do not get black spots all over them like their counterpart. What is Straight Edge Razor (Cut-Throat Razor)? The heyday or straight razors was, undoubtedly, 18th and 19th centuries, when shaving became popular and no other shaving tools were invented yet. So, mainly straight razors, sometimes called also cut-throat razors, are the part of History. In 1895 an American King Camp Gillette (his real name) invented the safety razor, and in a single year after it appeared on the market in 1903 there were sold 15,000,000Â of such devices. Of course, there is too much of tradition and habit in such things as shaving, so straight razors haven’t given up to this day. We have to say, though, that two leading or at least most honorable manufacturers, DovoÂ (Germany) and Thiers Issard (France), produce only several thousand straight razors for sale a year. For a new straight razor, you will have to pay from $50 to $250 and, maybe, up to a thousand. A good alternative would be to buy an old razor from eBay, for example. Actually, “old” in this case doesn’t necessarily mean well-used. Quite new razors are sometimes kept in families for decades waiting for somebody to decide to sell them. If you have an antiquarian streak in your character, straight razors will present many opportunities for it. What are the Advantages of Using Straight Edge Razors? First of all, it is especially clean shave. If you have a very tough and fast-growing bristle, the straight razor would be your lawful choice. Some people say they never had a really close shave till they tried a straight razor. If such a razor is well-attended to, it won’t ever leave you with skin irritation.Â Having bought a straight razor, you won’t have to buy replaceable blades or cartridges ever after. The negative points are as follows. They are dangerous and demand a steady hand. If you have to shave in the morning, after sleep, it could happen to be not the best time for precise and careful movements. The shaving with a straight razor takes much longer time than other methods unless you are very experienced already. You will have to have a special strap for whetting the razor’s blade and go through this procedure before every shave. You must be very cautious with the razor: the slightest notch on the blade’s cutting edge (say, you dropped the thing) will make the further use of the razor impossible. All in all, we advise you to try a straight razor as a great alternative to double edge safety razor. Maybe it is exactly what you have been looking for. Typically, straight razor are designed to last for a very long time and what determines how long they last is the materials with which they are made. We only selected straight razor whose handles and blades were made from the highest quality materials available. In terms of the handle, we selected straight razors that were made from high quality wood resistant to decay and mold growth. For the blade, only straight razor made from high quality stainless steel or carbon steel were considered. Materials like these ensure that the cut throat razors actually last as long as is indicated in their specifications. Despite the fact that most straight razors have their price tags on the high side, the ones we selected are pretty affordable by the average man all things being equal. Since purchasing a straight razor is somewhat of a lifetime investment, it would be essential to purchase only the best but this doesn’t imply that you have got to break the bank in order to do that. So, what we did was filter the straight razor available on the market until we found the ones with the best quality and very affordable prices. Since price is not always proportional to quality, we were very careful not to make the mistake of judging quality based on price tag. We went through feedbacks from men and women alike who had purchased these cut throat razors and thoroughly researched their observations and complaints before selecting the best. Since these buyers already have first hand experience making use of the product, their opinions and judgements were taken very seriously and we cross checked these with research we did on our own end. In essence, we considered straight razors that had a lot of genuine positive reviews and favorable comments. Similarly, we tested a number of these straight razors in order to confirm whether the complaints about them were true. After doing these, we compiled the best and there you have them. We totally understand how difficult it might be to make use of something you haven’t had previous experience using. This is one of the reasons that we ensured that the razors we ended up listing are relatively easy to use. There is obviously no point in purchasing an everyday use product that would require reading a manual that looks almost like a journal. Therefore, we selected the straight razors based on the ones that would be easy to get the hang of within a short time period. Also, we made sure that they were beginner-friendly to an extent and also easy to manipulate until mastery is complete. The size of a straight razor is essential to how easy it would be to use it. Although we selected some large razors, we ensured that they weren’t too large to not be used easily. Moreover, the large blades are mainly for professional use. Other razors which we selected were basically portable and easy to use even for beginners. They are easy to manipulate in order to get a close and clean shave which is a guarantee for using straight razors. When all has been said and done, the fact remains that making use of a straight razor presents benefits that neither straight razors nor cartridge razors can give you. The lifetime investment state of the cut throat razor makes it a lot more attractive for use. Despite the fact that it was out of fashion for a while, it is clearly making a strong comeback and is very common among young and middle ages men. Furthermore, the amount of money you would save using a straight razor makes it one you should buy as soon as you can. Also, most straight razors are made with the best quality materials available. The parts do not wear out therefore, there would be no need to change the parts after using it for a while. It is also pretty easy to maintain and only requires a simple washing and wiping after use.